7" tall, includes 5 interchangeable hands and 2 interchangeable heads. 5" tall Akuma is from Street Fighter 15th Anniversary. Features super-poseable body with 35 points of articulation and 2 sets of hands. Balrog action figure includes extra head and set of hands. 6.5" tall figure features 27 points of articulation and 2 sets of hands. Features 33 points of articulation, interchangeable hands and head and includes a fireball accessory. Limited to a production run of 2,500. Generally a pacifist, Dhalsim fights to raise money for his village, but realizes that it might contradict his pacifist beliefs. Dhalsim has the power to suspend himself in midair, stretch his extremities in ways beyond the average human, breathe fire, read minds, and sense evil, the latter abilities he uses to locate the sinister Bison, and doing his part to aid those who can defeat the villain. He retired from fighting after the second World Warrior tournament, and continued to roam the world helping those in need. 6" scale. E. Honda began his training as a child, singularly focused on becoming the greatest sumo wrestler of all time. He would eventually achieve the highly-revered titled of "Ōzeki" (in the English localization, he was incorrectly stated as having achieved the title, Yokozuna). E. Honda became upset that the rest of the world did not view sumo wrestling with the reverence of the Japanese. He entered into the second World Warrior tournament intent on showing everyone that sumo wrestlers rank among the greatest fighters in the world. 6" tall. 3.75" & 4.25" tall figures feature over 15 points of articulation. 4.25" tall figures feature over 15 points of articulation. Ken has over 30 points of articulation. 6" scale. 6.5" tall figure features 35 points of articulation and 2 sets of hands. 6" tall figure features 33 points of articulation, interchangeable hands and flaming Shoryuken accessory. 4" & 4.5" tall figures feature over 15 points of articulation. Approximately 8" tall, includes Street Fighter sticker. Mika's goal is to be "Star of the Ring." To try to accomplish this, Mika decided she would travel abroad and battle famous street fighters even before she made her official debut. During that time, she met Zangief, a wrestler she is a huge fan of. Zangief inspired her as a pro wrestler to train hard for the next time they meet. 4" & 5" tall figures feature over 15 points of articulation. 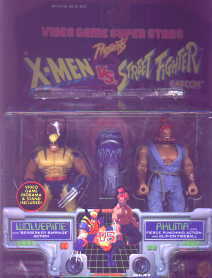 X-Men vs. Street Fighter 2-Pack features Wolverine with "Berserker Barrage" action and Akuma with Fierce Punching Action and Clip-On Fireball. 5" scale. As the greatest professional wrestler in the Soviet Union, Zangief was contacted by a man named Erai Hito (Great Man) to represent his country in the second World Warrior tournament. Zangief agreed and began training in the extreme climates of Siberia, determined to demonstrate Russia's magnificent power to all of the world. With the assistance of his government, Zangief emerged from his training as "The Red Cyclone." A patriot through and through, Zangief opposed the activities of Shadoloo. During the course of his battles, Zangief would come to meet one of his biggest fans, the Japanese pro wrestler R. Mika. 6" scale.